The article deals with the problems of the legal nature of corporate relations. Several approaches to the scope of corporate law and corporate legal relations are investigated, namely: there is the theory of “complex legal relationships”; the theory of “business relationship” and the theory according to which, corporate legal relationships are a kind of civilian. Proved the expediency of classification by subjects, while paying attention to the fact that all relations are relations regarding participation in the community. 1. Vasyl'yeva V. A. Shchodo pytannya pro ponyattya korporatyvnoho prava // Pravove rehulyuvannya korporatyvnykh vidnosyn v Ukrayini: materialy nauk.-prakt. seminaru (28 lyutoho 2003 r.). [Concerning the concept of corporate law // The legal regulation of corporate relations in Ukraine: materials of sciences. pr. Workshop (February 28, 2003).]. Lviv, 2003. P. 10 (8–10). 2. Hlus' N. S. Korporatsiyi ta korporatyvne pravo: po-nyattya, osnovni oznaky ta osoblyvosti zakhystu: avtoref. dys. kand. yuryd. nauk. [Corporations and corporate law: notions, main features and peculiarities of protection: author's abstract. dis Cand. lawyer sciences]. Kyiv, 2000. 23 р. 3. Grazhdanskoe i torgovoe pravo kapitalisticheskikh gosudarstv. [Civil and commercial law of capitalist states]. Pod red. E. A. Vasil'eva. Moscow, 1993. P. 81. 4. O pozitsii angliiskikh yuristov po dannomu voprosu, sm., napr. [On the position of English lawyers on this issue]. Brian R. Cheffins, Company law: Theory. Structure and operation. Oxford: Oxford Univ. Press, 1997. 5. Kibenko E.R. Korporativnoe pravo: ucheb. posobie. [Corporate Law: Textbook. Allowance]. Kharkiv, 1999. 480 p. 6. Kravchuk V. M. Korporatyvne pravo. Naukovo-praktychnyy komentar zakonodavstva ta sudovoyi praktyky. [Corporate law. Scientific and practical commentary on legislation and jurisprudence.]. Kyiv, 2005. 720 p. 7. Korporatyvne pravo Ukrayiny : pidruchnyk [Corporate Law of Ukraine: Textbook]. V. V. Luts', V. A. Vasyl'yeva, O. R. Kibenko, I. V. Spasybo-Fatyeyeva ta in. ; za zah. red. V. V. Lutsya. Kyiv: YurinkomInter Publ, 2010. 384 p. 8. Sarakun I. B. Zdiysnennya korporatyvnykh prav uchasnykamy (zasnovnykamy) hospodars'kykh tovarystv (tsyvil'no-pravovyy aspekt) : Monohrafiya [Implementation of corporate rights by the participants (founders) of business associations (civil-law aspect): Monograph]. Kyiv: NDI pryvatnoho prava i pidpryyemnytstva APrN Ukrayiny Publ, 2009. 156 p. 9. Syroedova O. N. Aktsionernoe pravo SShA i Rossii (sravnitel'nyi analiz). [Joint Stock Law of the USA and Russia (comparative analysis)]. Moscow,1996. pp. 17–19. 10. Spasybo-Fatyeyeva I.V. Vchennya pro korporatyvni prava i tsyvilistychna doktryna [The doctrine of corporate law and civilization doctrine]. Pravo Ukrayiny. 2014. No. 6. pp. 84–92. Available at: http://dspace.nlu.edu.ua/bitstream/123456789/6144/1/Spasybo- Fatieieva_84_92.pdf 11. Spasybo-Fatyeyeva I. V. Pravova pryroda korporatyvnykh vidnosyn // Visnyk hospodars'koho sudochynstva [Legal nature of corporate relations // Bulletin of Economic Judicial Proceedings.]. 2007. No. 5. pp. 87–99. Available at:http://217.76.198.234/cgibin/irbis32r_01_opac/ cgiirbis_32.exe?Z21ID =&I21DBN=IBIS&P21DBN=IBIS&S21STN=1&S21REF=&S21FMT=fullwebr& C21COM=S&S21CNR=&S21P01=0&S21P02=0&S21P03=M=&S21STR= 12. Tsikalo V. Korporatyvni prava: ponyattya, oznaky ta klasyfikatsiya [Corporate Rights: Concepts, Features and Classification]. Pravo Ukrayiny. 2010. No. 11. pp. 102–109. Sosula А. "Legal nature of corporate rights". 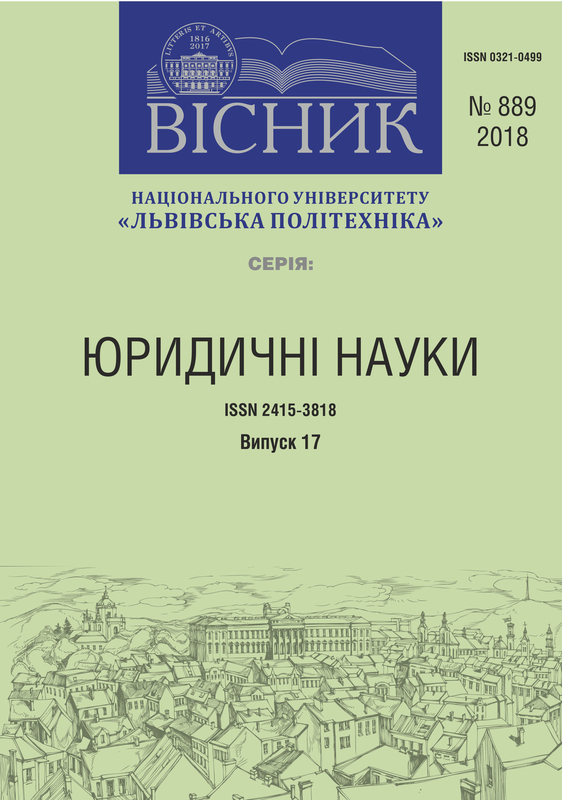 http://science.lpnu.ua/law/all-volumes-and-issues/volume-5-number-889-17-2018/legal-nature-corporate-rights.